Stocks are moving out of step with each other the most they have since just before the end of the tech bubble, and the significant lack of correlation is possibly due to Fed rate hiking, trade wars or the aging bull market. But when correlations are this low and stock valuations are very high, as they are now, it is a negative warning for stocks and could signal a 10 percent or greater correction, according to James Paulsen of Leuthold Group. Stocks are moving out of step with each other the most they have since just before the end of the tech bubble, and with stock valuations at a high, that could be a warning. In January 2001, before tech went bust, stocks diverged as growth flourished. Everything named dotcom boomed, but old line industries puttered. There hasn't been such a divergence between stocks in the overall market since then, not even during the Great Recession. The current market's low correlation comes as valuations soar. At 22, as measured by the trailing price-to-earnings multiple, valuations are higher than they've been 84 percent of the time since 1952. "Correlation is at one of the lowest levels in the post-War era," said James Paulsen, chief investment strategist at Leuthold Group. "The combination is damaging. 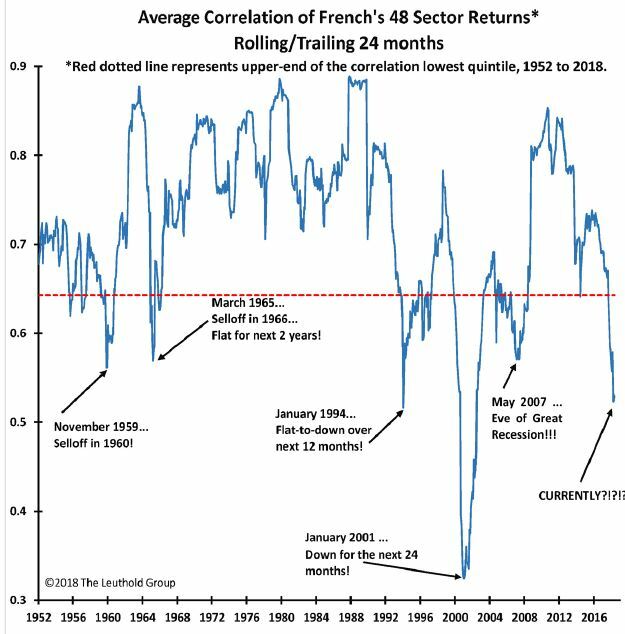 We now have record low correlation at the same time we have high valuations, and the combination is bad for the market." "When you have this situation of the lowest quintile correlation against the highest quintile valuation since 1952, you have 10 percent declines on average," said Paulsen. The aging bull market, Fed policy changes and the trade wars, which have resulted in weakness in stocks of multinational companies and strength in domestic-oriented names, are all potential factors behind the fall in correlations. He said that, alone, low correlations and high valuations do not necessarily spell trouble, but the combination has been a negative warning for the market. While the bull market could even continue for a few more years, the correlation and valuation extremes suggest a period of turbulence, he said. Paulsen studied correlation, using 48 sectors that include a broad universe of stocks that went well beyond the S&P 500. He charted the past 24-month rolling-average correlation of returns from the 48 industry sectors to the return of the overall stock market since 1952. Paulsen said correlation may reflect Fed policy actions, like now. During periods of easy money, liquidity increases and interest rates fall, sending stocks higher across the board. But when the Fed is tightening, liquidity is restricted, yields rise and more stocks are left "impaired," as correlation declines. For instance, Fed rate hikes might be bad for some sectors, like housing, but good for others, like banking. "Trade wars have played a role," he also said. Basic materials, industrials and emerging markets have all taken a hit in recent months, but tech has not been as affected, and small caps have been boosted because of their domestic focus. Paulsen said correlation is also a proxy for market breadth. High correlation implies all stocks are moving in tandem, with broad participation. Low correlation means more stocks are falling behind. Correlations often decline, or become looser, as a bull market matures and investors are more confident and able to discriminate between names and sectors. Correlation can become high again during periods of investor panic or bear markets, when all stocks get sold. When investors get fearful, they shift focus from individual stocks to asset classes, pushing correlations higher.